After a short sleep during which I woke up scratching my arm from “something” biting me, we had another massive breakfast before saying goodbye to the friendly family and heading back to the felucca. Before leaving, Aly & Jackie had henna tattoos drawn on their arms. Turned out that instead of using the safe brown ink, she used the black ink which can have side effects due to the hair dye that is mixed into it, one of which is DEATH. This was according to Shaun’s Egypt travel book, a much scarier version than the girls were reading. They made us promise to rush them to the hospital should they show any signs of impending death, but so far so good. We had to stop sailing soon as the wind threatened to overturn us, so we pulled into a nice sheltered spot for lunch, where our arrival was loudly announced by a donkey tethered to a tree. Much better than any watchdog. After a very long, lazy lunch we headed off downriver again and finally pulled into our sleeping spot – a flat, sandy, very open area dotted with little farm huts and cattle or donkeys tied near the river. By now the couple of beers I’d had were threatening to explode my bladder, but I was forced to wait impatiently for the guys to build our “tent toilet” (or the “temple” as they called it). It even had a toilet seat mounted on metal legs to put over the hole. Lahdidah! By the time they were done fluffing about as men tend to do when building anything, I was prepared to pee in the centre of the soccer pitch if necessary, and was more than glad to be the one to christen it. That night there was a massive wind blowing through the boat while we huddled in our thin sheets, having been told not to bother bringing sleeping bags. So I had a pretty average night’s sleep curled in a shivering ball as all my warm clothes were stored under the deck, only to discover the following morning that blankets had been placed on the deck after I’d gone to bed. Thanks for the heads up guys! The rising sun soon heated up the deck and we awoke to the smell of pancakes frying. Yum! Again, so much for losing weight this holiday. We then sailed for about 30 minutes to our meeting point, with a little excitement along the way when our captain tried showing off and in the strong wind and tacked so sharply that one edge of the boat went underwater, wetting Shaun and Joe who were lying on that side. I remembered mum’s warnings about feluccas tipping over and had visions of the boat sinking and all our gear with it. Not cool. We were met by our van and headed off on the 3 hour drive to Luxor. 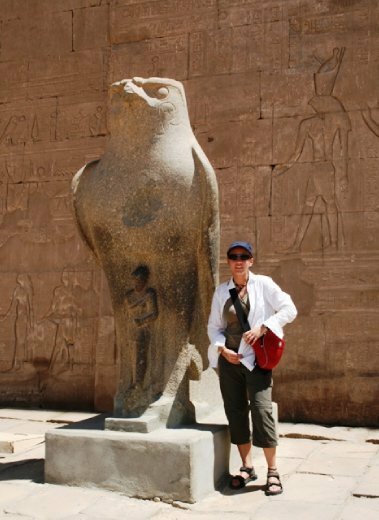 On the way we stopped at Edfu temple, built for the falcon-shaped god Horus, the son of Isis and Osirus. We were practically the only people there, which was great for wandering around the maze of side-rooms and passages pretending to be Egyptians and taking photos of the decorated pillars and empty temple. In the back was a boat-shaped altar with a carving of a falcon, and a room containing a wall of hieroglyphics dedicated to recording the recipes for the various perfumes used in temple worship – apparently the only such find of its kind. After a much-needed toilet break, and fighting off the vendors trying to sell us water despite the fact that we were all carrying massive bottles of water (NOT your ideal target audience), we scrambled back into the cool of the bus and slept our way to Luxor. We had the rest of the afternoon free, so after a short tour of Luxor, we stopped for a late lunch at Sam’s favorite joint: Snacktime. Which is now my favorite eatery in Luxor, with great falafel & chicken wraps, as well as free WiFi. We then wandered into town to pick up some beer, where Jen & Shaun were in their element, bargaining the salesman down from EGP250 for 24 large cans to EGP160. Which works out to about EGP6-7/can (just over an Aussie dollar), less than what the Lonely Planet recommends at EGP8-10, and much less than the EGP28 they were charging at the hotel in Aswan! We retired to the top floor pool area for a late swim, despite the pool being “closed” at 6pm, and talked rubbish over beer until they turned off the lights at 11pm, a subtle hint that it was bedtime. Bloody Aussies.